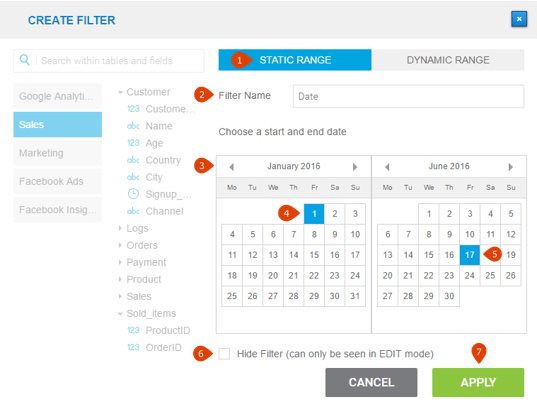 Using a time filter with a static range allows you to select a custom date range from a calendar widget in the filter panel on the right side of your dashboard. In the Create Filter popup, select the Static Range tab. Choose a name for your filter. Select the month for your starting and ending dates. Simply click on the left or right arrow to flip through the calendar pages. Click on your starting date. Click on Apply and the filter will be added to the filter panel on your dashboard.